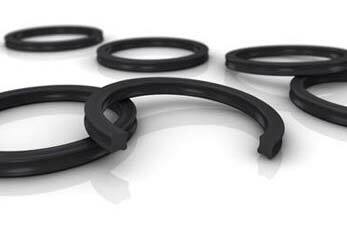 Our company name figures among prominent Manufacturers, Exporters and Suppliers of Quad Ring Seals in the industry. Designed with precision, our Quad Ring Seals are widely used in both dynamic as well as static industrial applications. Furthermore, we also focus our Quad Ring Seals to strict quality monitoring processes at numerous levels in our edifice process to find out the best quality and design features. These Quad seals are four lipped seals with a specially developed sealing profile that provides twice the number of sealing surfaces as an O-Ring. The main advantage of this unique four lipped design is that provides lower friction than an O-Ring and due to its square cross section, it resists spiral twist. In static application method application Quad seals are fitted in the assembly where there is no dynamic movement. In the dynamic system quad seal is stretched over the root of a groove with help of an internal groove, whereas for external grooves, these seals are installed in compressed format.